Success comes in different forms and different ways. Define your success, and you will be successful in your life, in your own way. Everyone's form of success can look different, some people put relationships & love first, some people put career & fame at the top of their list. Start by defining what your success looks like. It doesn't have to be cray. 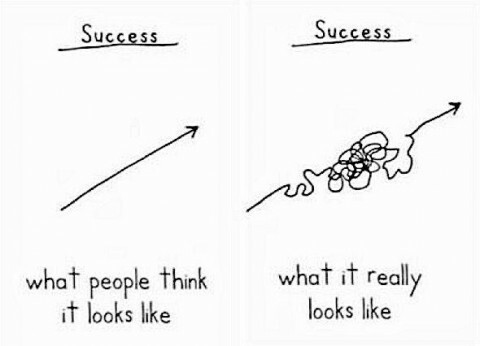 And when you do that, the real journey begins, because well.. as this amazing depiction shows, success takes twists and turns to get there. But the arrow keeps going. Your life is a journey, its never really a destination. Success doesn't have to resemble what others have. It has to do with what you want in your life. Go for it! Success is defined by YOU!